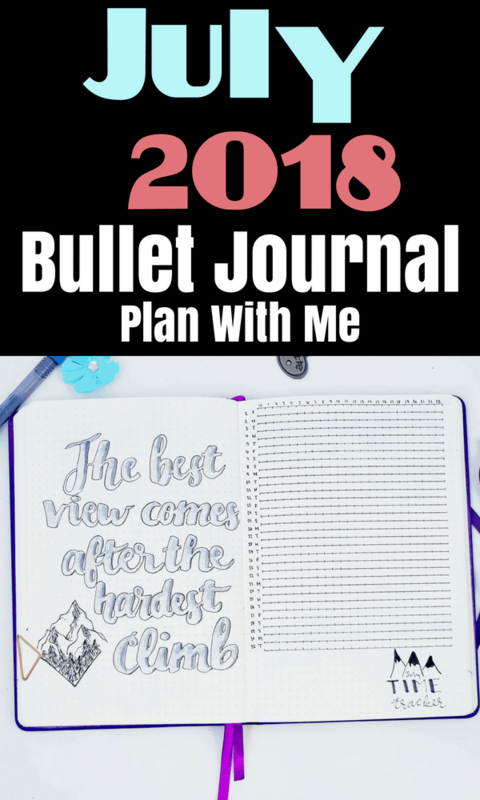 Are you ready for Planning Mindfully’s bullet journal Plan with Me July? I am! Let’s go! First- I admit I’m late to the Plan with Me game this month. 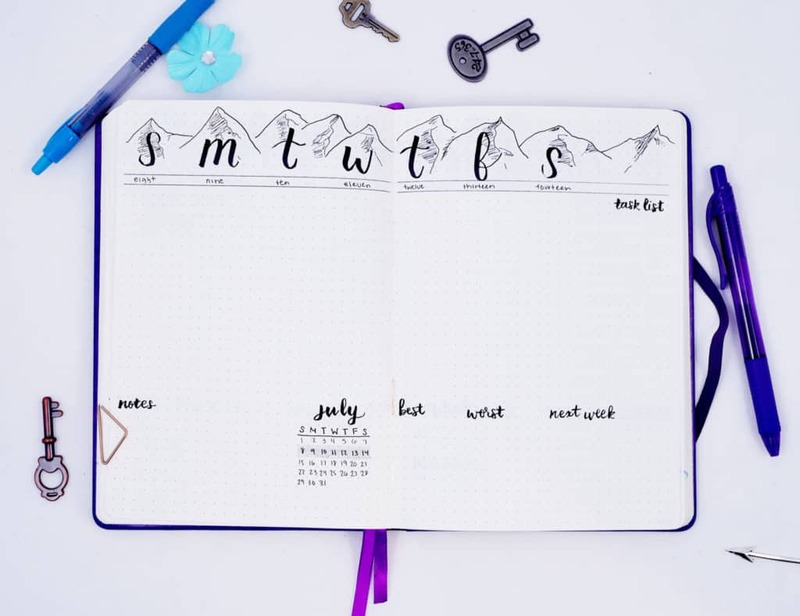 It’s been hectic transitioning to making Planning Mindfully my full-time job and, like I predicted, I didn’t get as much use out of my bullet journal for June. That also meant setting up for July! Thankfully, I was able to get everything set up for July, and I’m super excited to share this theme with you! With how busy life has been, I knew I had to simplify as much as humanly possible. While I’ve never been a complex artist, I would say that I’m not particularly minimal in my setups. I realized, with everything going on, that simplicity needed to be a necessity for the month. And I’ll say this is probably the most minimalist theme I’ve EVER done. It’s literally all black/white/gray (minus the review). None of my spreads took me more than 10 minutes to make. Yes, I draw fast. Maybe a little too fast, but that helps prevent me from being too perfectionist. That’s perfect for me while I transition into a new routine of being an entrepreneur! That said, let’s go into the theme for Plan with Me July! This post contains affiliate links- I may receive credit if you purchase items from links on my blog. Check out the disclosure for more information. Thanks for supporting Planning Mindfully! I have nothing but positive things to say about the Mountain theme. All in all, I’d highly recommend trying this theme. 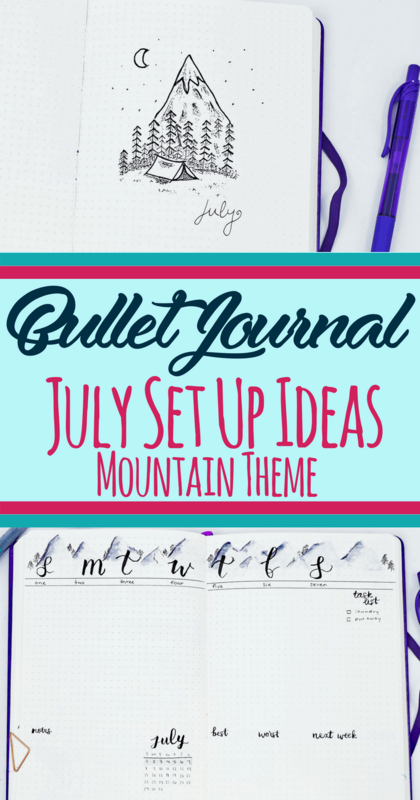 Mountains are a terrific bullet journal theme because the concept is timeless; you can pretty much use them for any time of year! 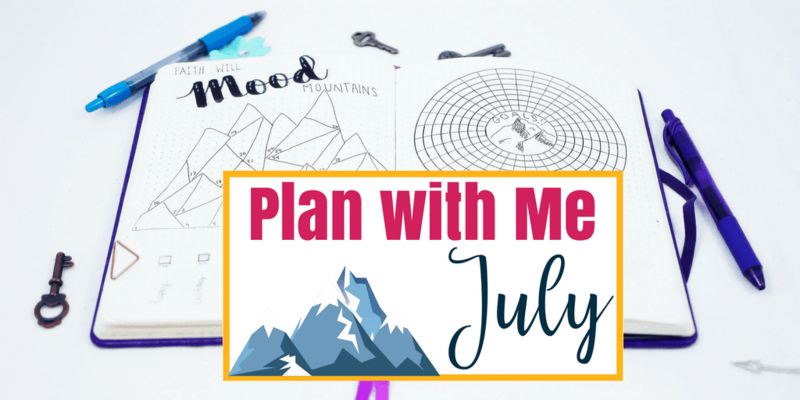 I definitely think Plan With Me July has been one of my favorites so far, and I will definitely explore more minimalist theme options in the future! I thoroughly enjoyed creating this image for my cover page. It was nice to step away from all color, much like I had in my June Plan With Me. All I used to create this fun drawing was my Sakura Pigma Micron pens! I believe I used .005, .02, .05, and .08 size. This month’s calendar page was a little more complex with the drawing; yet, it was still easy to create. A lot of mountain structure is shading, and the trick is to get the shading consistent over each of the peaks. I mostly used my Sakura Pigma Micron pens again, though I did actually get out a light gray Tombow pen to give a little more definition and color within the shading. I used my Tombow Fudenosuke brush pen for the lettering. 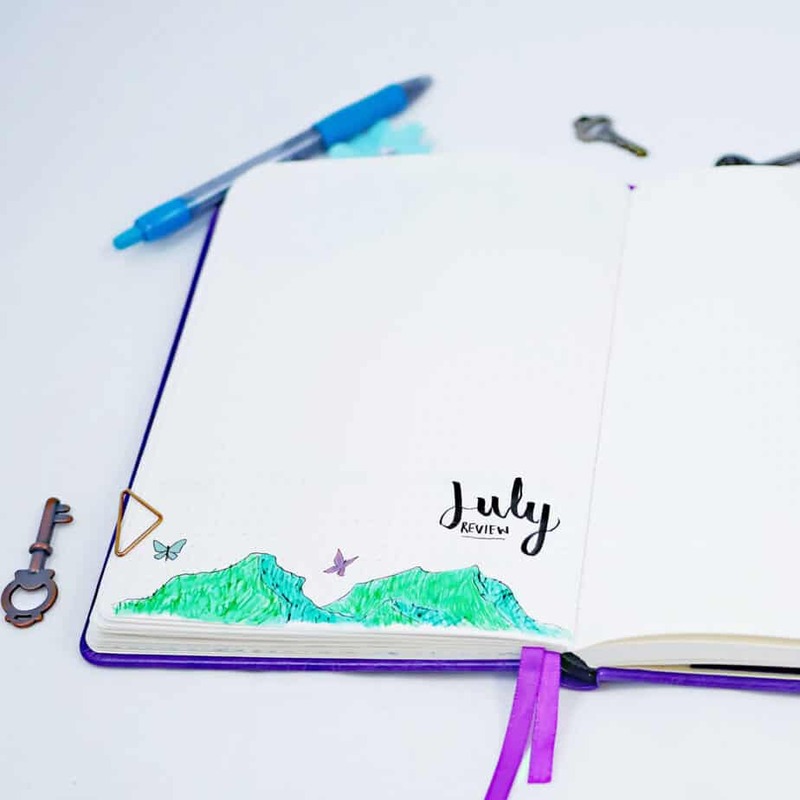 Here are a few of the other monthly pages I created for the July Plan With Me! The first page was my mood tracker. I decided I needed to seriously simplify the concept again; creating individualized charts for each mood, each day was starting to get a little challenging to maintain. I decided to go back to the one mood per day design, where I select the most strongly experienced mood for my primary. Not to mention, I felt pretty proud of myself over my epic pun! The second page was my goal tracker; didn’t make a lot of adjustments to this layout. I did add a nice quote from Bo Jackson; “Set your goals high and don’t stop till you get there”. I’ve always enjoyed using quotes that relate to my theme! Majority of the page was done with Sakura Pigma Micron pens, with some lettering and colors from my Grayscale Tombow Dual Brush Pen set. The circle tracker came from my trusty Moxidorie compass stencil. Seriously, if you haven’t purchased one yet, you need to! It’s a staple in my bullet journal supplies! 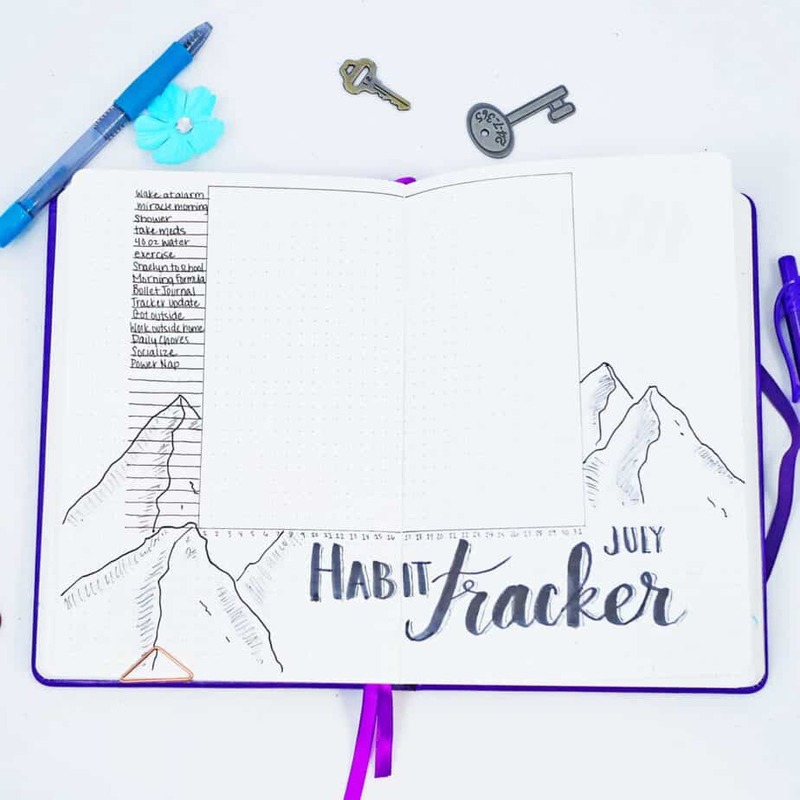 My habit tracker layout didn’t change much. I accidentally drew mountains over the label area though; I was a little worried that it would make the text hard to read. Thankfully, it seems like that’s a non-issue! 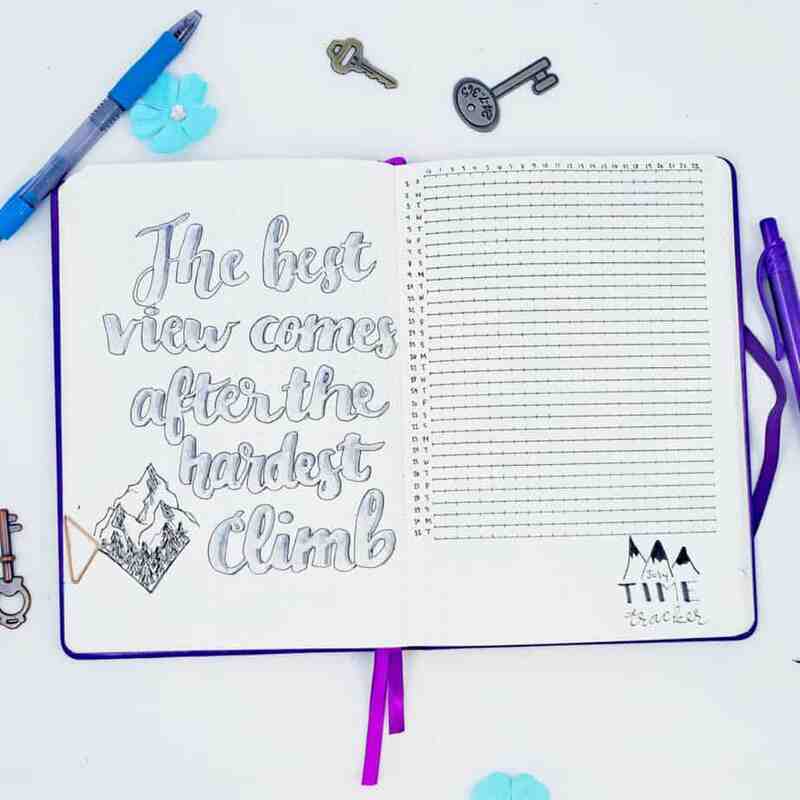 Since separating my mood and goal trackers, I’m still left with an empty page- so, I decided to use another quote: “The best view comes after the hardest climb”. The lettering is from Tombow Dual Brush Pens Grayscale set, and outlined with the Sakura Pigma Micron fineliners. The doodle on the lower left also came from the fineliners. For the time tracker, I also used Tombow Dual Brush Pens and Sakura Pigma Micron fineliners (catching a theme, yet?). I made a mild transition to a less cluttered appearance; instead of writing out each hour of the day for each day, I decided to put that information in the header. We’ll see how this layout works, I guess! For my weeklies, I went simpler than ever by pretty much creating no structure within the boxes whatsoever. We’ll see how I handle lack of structure, but I have to admit, I loved how easy it was to draw each spread. For the Plan with Me July weekly bullet journal spreads, I used Sakura Pigma Micron Fineliners, Grayscale Tombow Dual Brush Pens, Tombow Fudenosuke Brush Pen, Zebra Mildliners, and a ruler. The last page, as always, is my monthly review. I decided this time to leave it very unstructured; possibly out of laziness, but mostly because I’ve found that I haven’t been using the structures as much as I want in past months. 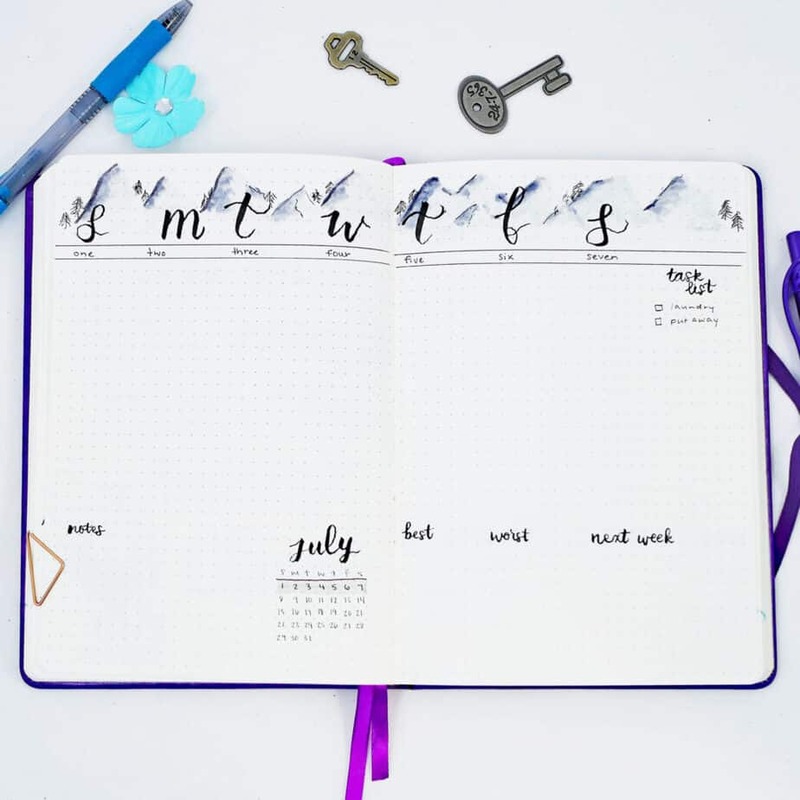 I decided to see if a freestyle note-taking option would be a more fun choice for the Plan With Me July monthly review. 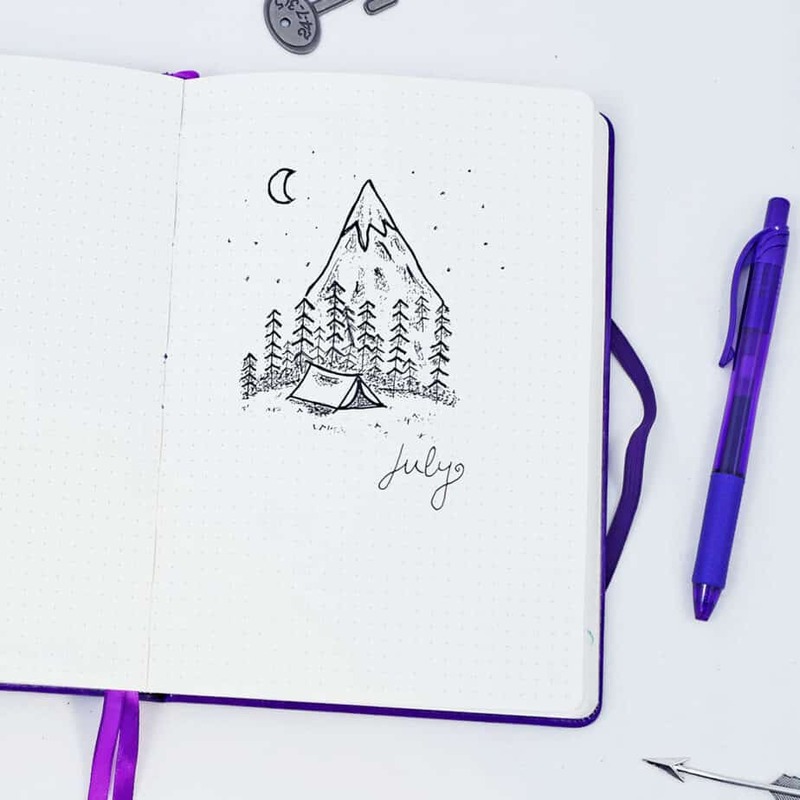 Every month, I like to talk briefly about how the previous month went in my bullet journal! I believe this is a great experience to discuss what went right, what went wrong, and also give you an opportunity of what the last month actually ended up looking like. Like I predicted in June’s Plan with Me, I pretty much did not use my bullet journal at all. If you want to know why that happened, read the post. If you got a chance to see how detailed I went into June 2018, I’m sure this is on your mind: Why did I go through ALL that work when I barely used it? Honestly, it doesn’t prevent me from using a bullet journal forever. I recognized that it was going to be a tough month. At the same time, when I was dealing with stress getting to do all that amazing art was really relaxing. It was one of the ways I could stay sane when I felt like everything was imploding on top of me. 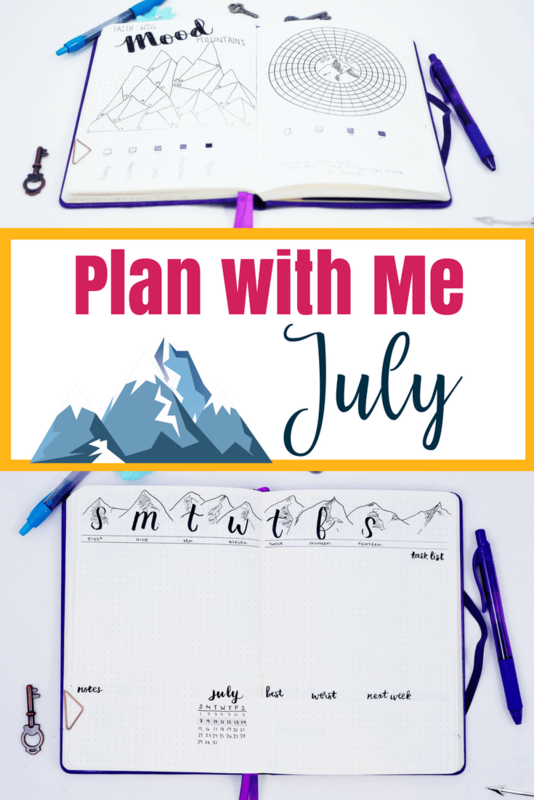 Now it’s your turn to get involved with the July 2018 Plan with Me! 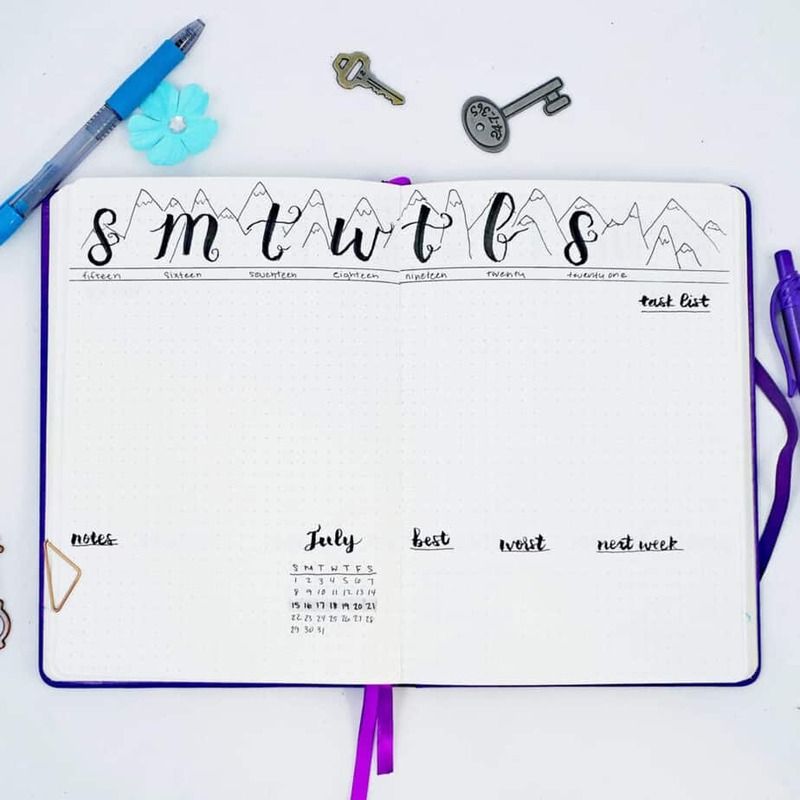 If you create any bullet journal or planner spreads you want to share in general, you can share using the hashtag #plannerpicturefeature! Hop over and follow me on Facebook, too! You can always tag me in any of your bullet journal and planner posts! I’ll be sharing other content a few times a week. I need to step up my Twitter game, so follow me here! 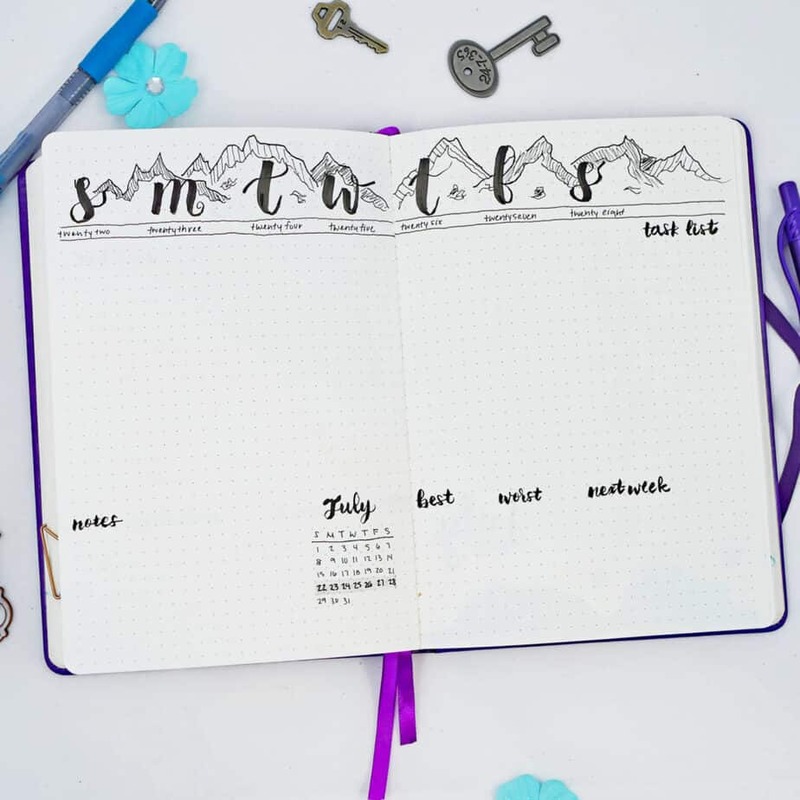 Make sure to tag me in any of your bullet journal posts that you’d like me to feature! Have you joined my email list yet? If you, you should join now and get involved. You get lots of cool information, updates on products, and discounts on stationery! Not to mention, you’ll be among the first to hear about any new products that I’m working on (and have the opportunity to get it before anybody else!). 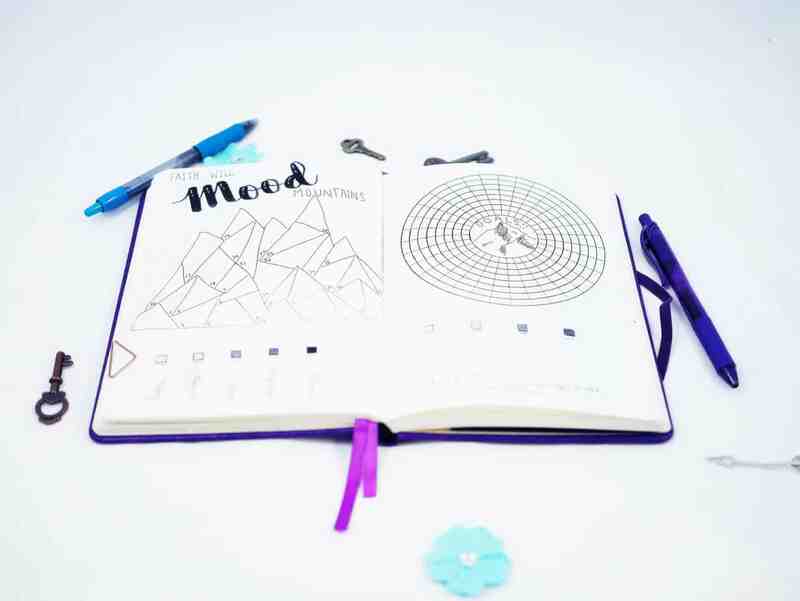 After you get my welcome email, you can then reply back if you’d like to share your bullet journal images with me! If you share your content by email, you’ll have the opportunity to be featured in my weekly newsletter that goes out every Saturday. 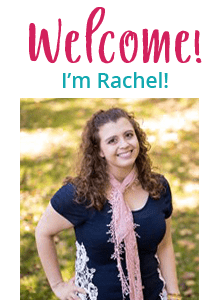 Check out past Plan With Me posts! 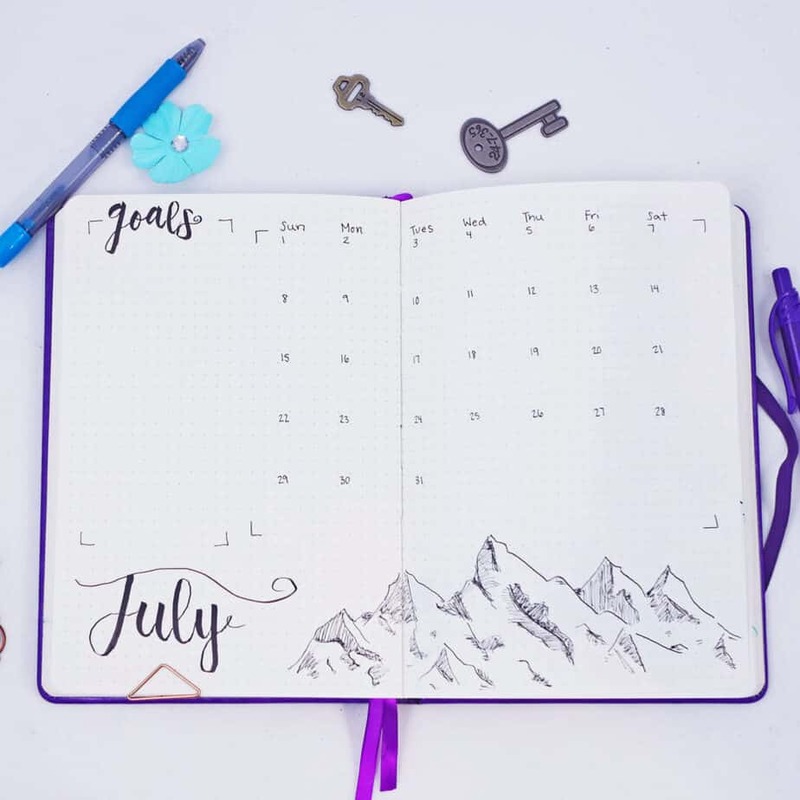 If you chose a different theme for July, I’d love to hear about your choice! Tell me in the comments! Did you love this Plan with Me July? Please share it with others on Pinterest! I love the mountains! Thank you for making things simple. 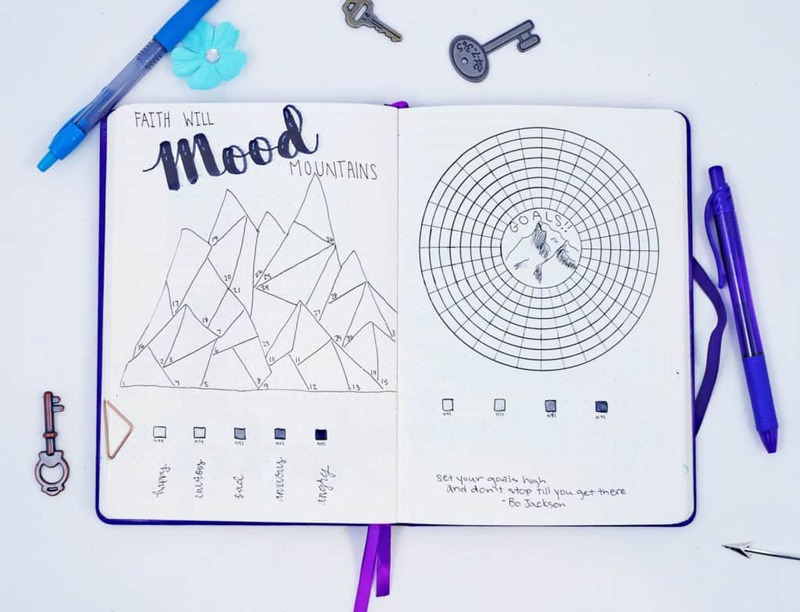 I have been bulletproof journaling for over a year and you are absolutely correct, some of those layouts are sooooo beautiful yet intimidating. Thanks for making some simple things.